Safety concerns already prompted the installation of new LED streetlights outside of two of Cincinnati Public Schools' biggest high schools in late December. Now, plans are in the works to expand that citywide. On Thursday, City Councilman P.G. Sittenfeld and Duke Energy president Amy Spiller announced a partnership to upgrade lights to LEDs in all 154 school zones across Cincinnati. CINCINNATI — Safety concerns already prompted the installation of new LED streetlights outside of two of Cincinnati Public Schools' biggest high schools in late December. Now, plans are in the works to expand that citywide. On Thursday, City Councilman P.G. Sittenfeld and Duke Energy president Amy Spiller announced a partnership to upgrade lights to LEDs in all 154 school zones across Cincinnati. 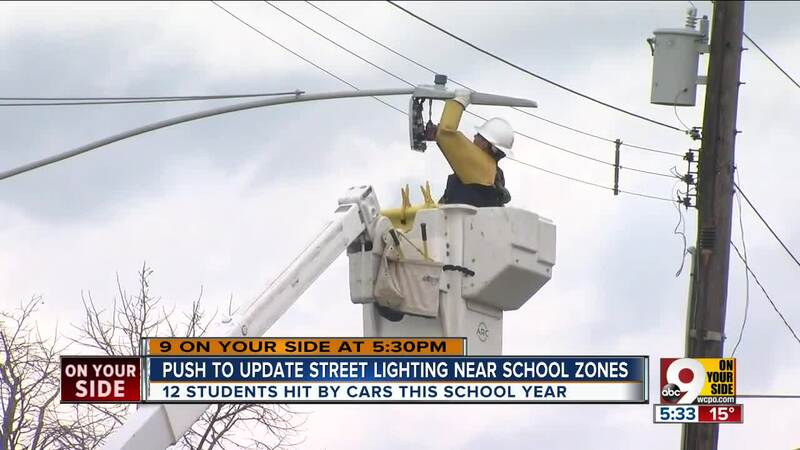 Upgrading the lights will cost about $10,000 per school zone, roughly $1.5 million altogether, according to Sittenfeld. He said he expects the plan to be included in the upcoming city budget process. It will take several years to fully implement the plan, and Sittenfeld said he expects officials will prioritize which school zones to upgrade first based on factors like school size and the number of pedestrian safety issues at each. "If drivers can't see well, if visibility is poor, then students walking in school zones, students crossing streets in school zones are going to be less safe," Sittenfeld said. The first new lights were installed on Ferguson Road outside Western Hills University High School and Gilbert A. Dater High School in West Price Hill. "The difference literally was night and day," Sittenfeld said. Parents from the two schools had held a pre-dawn rally asking drivers to slow down after three students were struck by drivers while walking to school in a week. And in September, 15-year-old Gabby Rodriguez died after she was hit while running to catch her bus to Western on Harrison Avenue. At least 13 Cincinnati students have been hit by cars this school year. Mother Jasmine Coaston said it's a disturbing trend. "I think that we are all committed to making sure that students have a great education, but first we have to be committed so that they can get to their education safely," she said. The plan will still need to go before council for a formal vote.